This Tuscan landscape tapestry "Tuscan Afternoon" is from the work of contemporary artist Brad Simpson. Here in this tapestry we see a village archway and path leading through a garden, to the scenic and beautiful Tuscan region of Italy surrounded by the hilly landscape. The rich warm color palette suits the region very well. The golds and greens complement the blue of the water and burgundy of the pot and distant hills to create a balanced color palette. Composed of its beautiful countryside and warm, favorable climate, this region is perhaps the most loved region fo Italy, for its its scenic landscape which goes hand in hand with its reputation for its world coveted cuisine and wine. 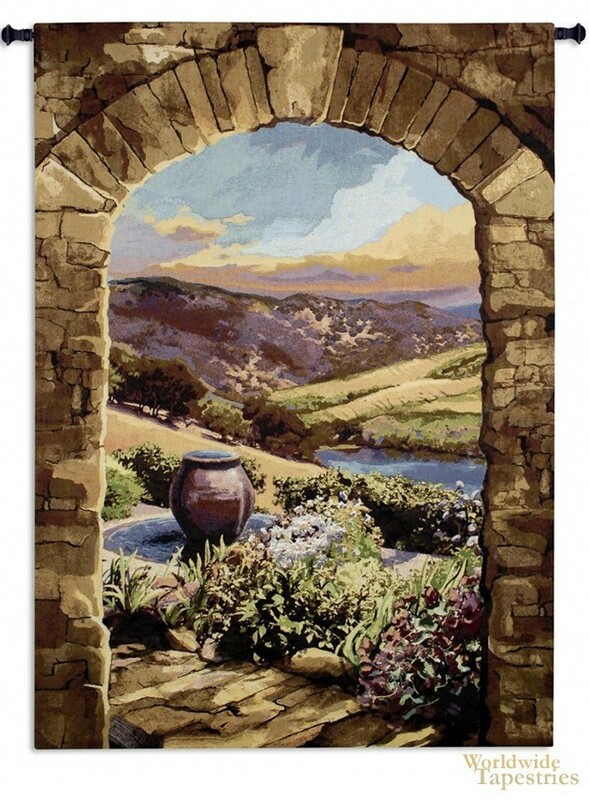 This landscape tapestry "Tuscan Afternoon" is backed with a lining and has a tunnel for ease of hanging. Note: tapestry rod and tassels, where pictured, are purchased separately. Dimensions: W 44" x H 59"
Dimensions: W 64" x H 90"